Since June 2013 every Member has a SOCKS5 proxy included in his Account by default and is free to use, if desired. To explain what a SOCKS 5 proxy is and what it is good for, below gives a brief overview first. nVPN offers on each of its countries and for every member by default a SOCKS 5 Proxy solution, which can be used as a standalone proxy, OR additionally in combination with OpenVPN. In order to gain extra safety, you can as well start chaining now: "other VPN service using OpenVPN => nVPN SOCKS5"
Some Users - even when using TCP/443 - are still facing restrictions, or still being unable to browse with OpenVPN reliably, in such cases the SOCKS5 proxy for straight browsing, simple downloading activities, can be a real good alternative! What is SOCKS proxy server and what is HTTP proxy server? So what is the actual difference between HTTP proxy server and SOCKS proxy server? HTTP proxy server - the HTTP proxy server was originally designed to be used only with HTTP protocol. To say it simpler, if you need to open any http:// or https:// like web address, HTTP (SQUID) proxy servers are the best solution in 90% of cases. There are almost no difference between SOCKS and HTTP proxy servers, if they are used for HTTP protocol (we will speak about rare cases bit later). SOCKS proxy servers - the SOCKS proxy servers are more flexible and do not seize you. While HTTP proxy servers could hide your IP only when you are browsing a web page, SOCKS5 proxy server can keep your information private, even when you are using such programs like ICQ, Skype, MSN or even email clients like Outlook, TheBat, Thhunderbird. SOCKS proxy servers are designed to be used with ANY protocol you wish. Can HTTP proxy server used in the same way like SOCKS proxy server? It is said here Bust the myth: SOCKS better than HTTP proxy that if you will use CONNECT method of HTTP proxy server, then HTTP proxy server could be used for any protocol, the same like SOCKS proxy server. That definition is right, but with one exception: in 90% cases HTTP proxy server limits protocols for which CONNECT method could be used. Basically CONNECT method is allowed only for HTTP protocol over SSL or https:// like web addresses. That is because HTTP proxy server filter/updates client's each request. They need to change header information before they will forward it to the destination host, meanwhile SOCKS proxy servers work more like an open relay. SOCKS proxy server tunnels data directly to the destination host (address) as it comes from the client, without changing anything in the source. That is why SOCKS servers are so useful and cannot be replaced with simple HTTP proxy servers. What are the differences between SOCKS4 and SOCKS5? The number 4 and 5 refers to the version of SOCKS protocol. These two versions are the most popular and became wide spread all over the world. The following new features were implemented in 5th version: various authentication mechanisms, support of UDP protocol and IPv6. We do not think that you will ever use directly UDP protocol, but there is a high chance that the program, for which you need to use proxy server, will use it. In that case nor HTTP neither SOCKS4 will work, the only solution to keep your IP hidden would be to use SOCKS5. Another advantage of SOCKS5 are the many various authentication mechanisms. 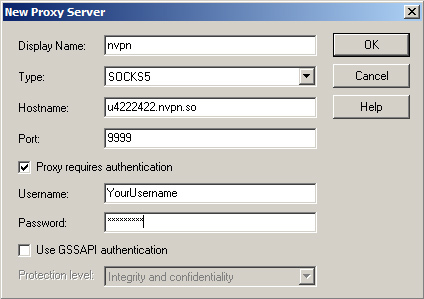 Without authentication, the SOCKS proxy server is publicly available, even if you do not want it to be a public one. As soon as you will setup SOCKS4 proxy server, any person can use it without permission, he/she just needs to know IP and the port of SOCKS proxy server. What are the advantages of SOCKS proxy server? As more SOCKS proxy servers are involved in a proxy chain, the higher is the security and privacy level. Also SOCKS proxy servers can create reverse connections. In some cases your local administrator could block all outgoing connections for security reasons. At the same time incoming connections could be kept open. In that case instead of establishing connection from your PC to SOCKS proxy server, you can ask SOCKS proxy server to establish connection with your PC. After that, communication between client and SOCKS proxy server will remain the same as if use establishes connection by his/her own. 6. Test shows success, we can proceed enabling the Proxy now! 1. You need the open source program "stunnel" Choose your version and download it. 3. IMPORTANT: After editing the file it needs to be reloaded, right click again on the stunnel icon and click on "Reload stunnel.conf"
4. To verify your data flow you can activate the "Show Log window" now. 8. Your Traffic is now encrypted with SSL. Verify the IP change on some IP-check website and thats it.